MMP Architects is currently in construction phase, acting as Prime Consultant on Winnipeg’s first Max’s Restaurant. The 4,500sf space, located at 1-1225 St. James Street, will seat 172 people and will serve Max’s Filipino dishes, including their signature fried chicken. Our team worked together with the franchisee, a group of several local family members known as Albin Group, to create an interior environment utilizing Max’s recently updated design guideline. The Winnipeg Max’s restaurant is the first location in Canada designed using these new standards. The interior will feature Max’s red and green colours, reclaimed wood accents, playful lighting, 22’ high ceilings, and ample daylight from two large windows in the dining area. Please see above for a few progress photos, and stay tuned for a grand opening date! 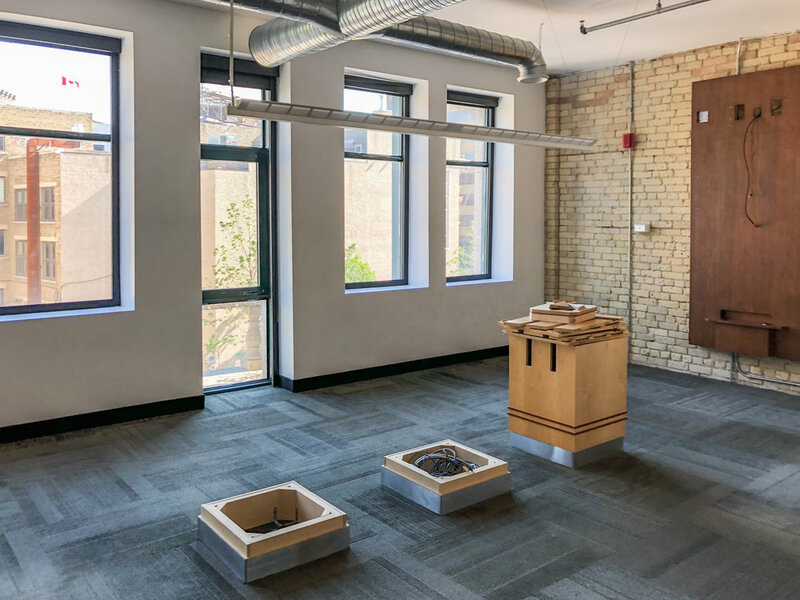 On June 15, 2018 MMP officially handed over the keys to our home of nearly 14 years, 214 McDermot Ave. As renovations of our new office space are not quite finished, we’ll be working in a temporary space on the second floor of our new building at 123 Bannatyne for most of the summer. Stay tuned for some project pictures and updates in the coming weeks! Please see above for a few photos of a very empty looking 214 McDermot Ave. 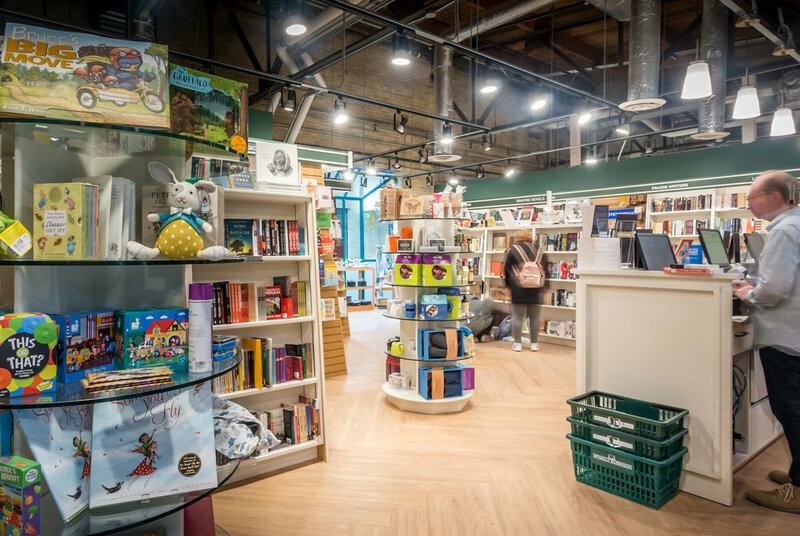 In late 2017, MMP was hired by McNally Robinson Booksellers to design and develop their new 850sf second floor retail space at the Forks Marketplace. The intention of the design of the space was to provide the feel of a traditional bookstore within a more streamlined, modern aesthetic. It was important to owners Chris Hall and Lori Baker that the space would be designed to feel like a familiar extension of their existing Grant Park store. Because the back of the store features windows that overlook one of the atrium spaces, special attention was given to the quality of light in the space. A layout was chosen that allows patrons views through the store to the windows beyond. The bright and open interior was further emphasized through integration of white shelving, providing a background that allow the books to be the key focus in the space. 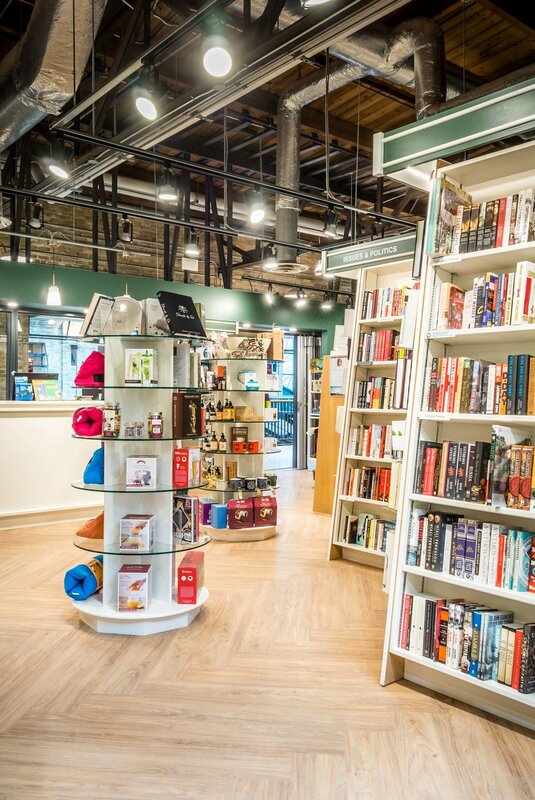 The interior and exterior millwork, as well as McNally Robinson’s signature green is used throughout the space as a nod to the existing store and to their brand identity. The resulting space features a mix of traditional and contemporary elements, providing a familiar and comfortable, yet modern feel. The store offers a carefully curated selection of best sellers and new releases, with special attention given to indigenous and local writing. The store has had a constant flow of visitors since opening in February 2018, and plans are already being made to expand further into part of the adjoining space formerly leased by Sydney’s restaurant. Please see above for a few photos of the newly renovated space. In addition, a feature in the Winnipeg Free Press can be found here, and more information on store hours of operation can be found here.